Home >> Awards >> 2002 >> Babloo: A world of interactive edutainment brought to you by a monkey! A world of interactive edutainment brought to you by a monkey! This site is designed for children and parents. It offers colorful, engaging content that is appropriate for many ages. There are games, jokes, stories, and lots of factual information. Available in many languages, the site originates in India. This very child-friendly site is colorful and graphic intensive. It is best viewed with a screen resolution of 800 x 600. Picture menus direct children to the areas they wish to visit. Babloo is organized around age levels. Separate pages are available for "toddlers" aged 3-6, "pranksters" aged 6-9, and "youngsters" aged 9-12. In addition, parenting hints are available. Navigation is through a main screen that loads with no menu bar or buttons to leave the site. You must close the window to move to any other site. Interactive signs take children to other menus. Some of the buttons seemed to not work very well, and some games require plug-ins. Babloo is an interesting, child-friendly site that has been rated by SafeSurf and several other child safety sites. It is available in English, Hindi, and many other languages. Different activities are available for each grade level. 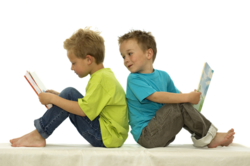 The menu for ages 3-6 includes nursery rhymes, moral stories, fairy tales and numbers. The menu page for children ages 6-9 offers articles on fire and water safety, stories such as Rapunzel, magic tricks and more. Children ages 9-12 will find lots of information and activities ranging from the Olympics to festivals around the world. Although slightly difficult to navigate, this site provides some interesting resources for parents and children. The site is very graphics-intensive and will load slowly on slow connection speeds, and also requires plug-ins and/or very recent editions of browsers.